Several friends and I have been re-thinking our decision several years ago to pack semi-auto .22 target pistols in our survival rucks. We normally carry .38 snubbies as EDC. Having an extra, longer barreled .38 Special revolver in the ruck with extra ammo useable in either gun seemed like a good idea.We decided to standardize on the .38 Special because it had better anti-personnel and defense animal potential than the .22s. We all owned several fixed sight, “service revolvers” which were reliable, accurate enough, readilt available and familiar. A wheelgun is simple anyone to operate and requires less training and practice to maintain proficiency than an auto pistol. We have confirmed to our satisfaction that four inch service revolvers, fed good ammunition are accurate enough to make 20-25 yard head shots on small game. There is no doubt that a .38 is a more sure killer than a .22 on larger varmints such as coyotes and larger small game animals such as raccoons or groundhogs. I started carrying my four-inch .38 Special Colt Official Police in one ruck and a 4 inch Ruger Police Service Six in the other. Both revolvers are sturdy, reliable, and accurate. The .38 Special is not your first choice as a bear gun, but a more likely threat is an upright, 2-legged human criminal actor or large dog such as a pit bull. This thought process was initiated by an experience in which an acquaintance had difficulty stopping a pit bull attack with a .22 handgun despite multiple hits, several of which were well placed. Animal control officers stated that in their experience that .38 Special +P would have probably likely stopped such an animal attack quickly. Had the first .22 hit been a head shot which penetrated the skull, the outcome would have been different, but little data is available on how well .22s penetrate a large dog skull at oblique angles and frankly, my experience with .22s does not inspire confidence in hot-blooded situations with large toothed animals. Today I now carry 100 rounds of .38 Special ammo in the ruck in addition to the six rounds in the gun and an A.G. Russell belt pouch with three Bianchi Speed Strips. This “Blackberry” carrier does not look like an ammo pouch, fits flat on the belt, tight against the body, and is low profile, yet holds eighteen .38 Special rounds. Just unzip, grab the center strip first, then the others won’t drag against the zipper in the event that you do need another. Speed Strips are loaded with Federal 147-gr. HydraShok +P+. Our boxed spare ammo is a full-charge 146-grain double-end wadcutter, Saeco #348, which we cast ourselves from wheelweights. A charge of 3.5 grains of Bullseye gives 850-870 fps from a four-inch revolver, which falls between standard pressure 158-gr. SWC and +P lead HP FBI loads in energy. This load groups as well as target ammo and penetrates 30 inches of water. The bullet does not expand, but its blunt profile gives full-caliber crush and has proven effective. Observations in the ER and on autotopsy table from that era confirmed that a wadcutter makes a larger hole than the LRN and SWC and penetrates deeply, without tumbling. Entry and exit holes produced by LRN are smaller, bleed less and show less damage in the wound track. Tumbling improves the performance of RN bullets, but is unpredictable. Fackler and other published stated the performance of solid SWCs is little better than LRN loads. The Armed Forces Institute of Pathology (AFIP) conducted “energy deposit” studies in 1970s in which rounds were chronographed near the muzzle, and again after the bullet exited a 20cm (7.8″) gelatin block. A standard velocity 158-gr. lead roundnose .38 Special bullet fired from a 4-inch revolver at 755 f.p.s. produces 200 ft. lbs. of energy, and exits the gelatin block at about 655 f.p.s., having a residual energy of 150 ft. lbs., depositing 50 ft. lbs. in the gelatin. Permanent crush cavity volume in gelatin is measurable and in direct proportion to kinetic energy deposited. A round which deposits twice as much energy in the gelatin block produces approximately double the crush volume. A target velocity factory 148-gr. hollowbased wadcutter fired from a 6 inch K-38 which strikes the gelatin at 780 f.p.s., produces the same 200 ft.-lbs. of kinetic energy as the LRN load fired from a 4 inch gun, but it exits the gelatin at 474 f.p.s., having a residual energy of only 74 ft.-lbs. and depositing 126 ft.-lbs.! This compares to many common .38 Special JHP +P loads, but with deeper penetration approximating .45 ACP hardball. To produce a “full-charge” wadcutter load 3.2 grains of Bullseye and the Remington HBWC factory bullet, or 3.5 grains of Bullseye with the Saeco #348 cast double-ender. These approximate the 6 inch revolver velocity of factory target loads, but do so when firing from a 2-inch snub. Velocity from a 4 inch revolver exceeds standard velocity 158-gr. SWC and LRN loads by about 50 f.p.s. We have confirmed the effectiveness of the full charge wadcutter on game in 30 years of field use. In the mid 1970s the FBI started using Winchester’s 158-grain all-lead hollow-point load X38SPD. Federal followed with its 38G and Remington the R38S12. Of these, the Winchester and Remington loads performed best. Federal went through several design changes using several different bullet alloys and cavity geometries before they got their load working. To get reliable expansion requires softer alloy which causes +P loads to foul bores and impair accuracy after 18 rounds or so. The Federal 38G load in particular which used a dry lube with no cannelures on the bullet caused severe cylinder binding in revolvers which do not have a cylinder gas shield. A gas shield or cylinder hub prevents gases carrying vaporous lead residue out the cylinder gap, from being deposited between the crane arbor and the cylinder recess on which it rotates. Remington and Winchester versions of these loads had grooved bullets with a heavy, waxy lube were less cranky in that respect, but you still have to be careful about cleaning and lubrication. At Ruger revolvers were assembled with a proprietary lubricant similar to Militec to help prevent the lead from binding. Applying a few drops of Mil-L-63460B (Break Free CLP) in the crane arbor each time you clean also helps. At Ruger a “hubbed cylinder” version of the Security Six, Speed Six and Service Six revolvers was developed to mitigate against the binding problem. This required milling a small flat across the barrel extension which protrudes into the frame opening at the 6:00 position to clear the hub on the cylinder. Machining the flat reduces the cross section though the barrel extension, which caused heat cracking problems when those revolvers were shot extensively with .357 Magnum ammunition. The hubbed cylinder was used only for law enforcement contracts for revolvers to be fitted with .38 Special cylinders when the lead +P ammo was specified. Later in designing the GP100 revolvers the charge hole spacing, and distance from the bore to cylinder axis was increased so that the cylinder gas ring could be incorporated without reducing barrel wall thickness through the exposed forcing cone region. 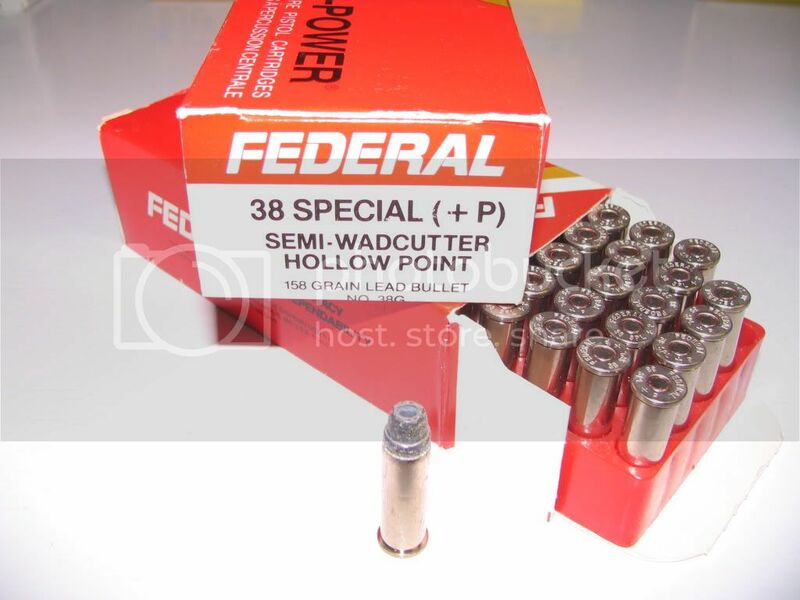 Todays best .38 Special hollowpoint load by a major US manufacturer is probably the Speer Gold Dot 135-gr. +P. Richmond PD issues this load to officers who carry .38 snubs off-duty and they have history on a number of officer involved shootings with it where it performed well. The lead “FBI load” is still produced by Winchester (X38SPD) and Remington (R38S12), if you can find them and will perform well and expand even from 2 inch barrels. No arguement there. Federal discontinued the 38G, but their 147-gr. JHP +P+ law enforcement load gives similar performance and gives 900 f.p.s. from a 2 inch Ruger SP101, if you can find any. While jacketed +P loads do not suffer from the cylinder binding problem, getting a jacketed bullet to expand reliably from a barrel shorter than 4 inches requires +P pressures. High volume use of +P and +P+ ammo is proven harder on the guns, particularly blue steel S&W K and J frames having a frame hardness of less than Rc20, (typical values for non-magnum revolvers of 80-90 “B” scale were common of Model 36 and Model 10 production before about 1990). If money were no object my friends and I would be happy to buy 2000 rounds of Gold Dot to divide among us. But to be realistic, however, the cost, about $1 per shot, and spotty availability of proven .38 Special factory defense loads is a real issue. We would like to practice with the same ammo we carry, but have to satisfy ourselves with a well-established hand load we have experience with, and confidence in, which works well in the field and shoots to the same place from fixed sight revolvers as our +P. So, we have decided to carry a limited, (though 24 rounds is probably adequate) supply of +P law enforcement loads for actual personal defense use. Our extra ruck ammo is intended for shooting meat for the pot or for protection against aggressive animals. The non-expanding, but deep penetrating, full-charge wadcutter load has the advantages of less meat damage, but has great crush cavity characteristics and deepest possible penetration. It works. Reliable, predictable, accurate, economical. Col. Fackler’s observation, and one in my friend “ER Doc” agrees, is that the hollowpoint .38 Special is not the “magic bullet.” When a bullet expands in the classic mushroom fashion, it reduces penetration. The best JHP defense loads such as Speer Gold Dot meet FBI penetration criteria. Not all JHPs do. Our reasoning is that maximum frontal area and tissue crush, combined with deep penetration adequate to defeat reasonable cover, a defensively positioned arm, or heavy clothing, which can still penetrate the breastbone and get through ribs into vital organs is important. Particularly in calibers of “marginal” energy, (200-ft.-lbs. or less) it is important to have the maximum meplat diameter (frontal area) consistent with reliable feeding. The wadcutter in a revolver makes the most of this. You also need adequate sectional density to ensure through and through penetration. Our reasoning is that if the FBI considers 14 inches of gelatin penetration adequate, we’d like 20+. Being able to shoot through both shoulders of a deer and exiting is desired. C.E. “Ed” Harris is well known to readers of American Rifleman, the Gun Digest and the Cast Bullet Association’s Fouling Shot magazine.During 12 years on the Technical Staff of the National Rifle Association he was a consultant to numerous military, law enforcement and firearms industry organizations and was officially commended by the U.S. Marine Corps Development Center, Quantico, Virginia for expert technical assistance provided during the Development and Operational Testing of the M16A2 rifle. He is a graduate of Virginia Polytechnic Institute, holds the Federal Emergency Management Agency’s Professional Development Certification in Emergency Management he is retired from a local government agency in Northern Virginia after 23 years of service.